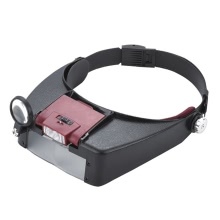 This 8x magnifying glass gead set allows up-close viewing of small objects, while reducing eye strain. Multiple magnification from 1.5x power to 8x power (when using all three of the lenses). Leaving both hands free this tools can be used by anyone whose profession or craft requires close accurate work. Optical grade polycarbonate lenses, magnification from 1.5X to 8X. Lightweight multiple acrylic coated lenses for comfort. Adjustable side pivots allow the visor to tilt at your fingertips, controls for adjusting the light beam. 2 bright LED bulbs in front center to illuminate your viewing field. Can also be used as a headlamp. Fits easily over prescription or safety glasses, can be worn over most glasses. Requires 2 AAA batteries (Not Included), removable for easy battery access.